This image shows the proposed plan for the Rubey Park remodel. It calls for expanded bathrooms, more workspace for RFTA employees and improved rider amenities. The Aspen City Council received design plans for the Rubey Park remodel project at Tuesday night’s work session. Construction is estimated to cost between $4 million and $5 million, though John Krueger, transportation director for Aspen, stressed the numbers are very preliminary. The design allows for 25 parking spaces for Roaring Fork Transportation Authority buses and the elimination of metered parking on Mill Street next to Wagner Park. Sheri Sanzone, of Bluegreen, the firm that helped submit the design, said the loss of parking could be offset by converting two-hour residential spots in the area to short-term meters, allowing for quick turnover of vehicles. Converting residential parking outside the Mountain Chalet on Durant Avenue, she said, is one possibility. “Anytime we lose parking spots, I’m not a huge fan,” Councilman Adam Frisch said, adding that he’s not entirely in favor of having buses lined up next to Wagner Park, either. Krueger said RFTA might only allow bus parking at Wagner Park during peak periods. He said RFTA will try to limit bus presence outside the transit center block but that the spaces along Wagner will be needed occasionally — especially during the winter. A $200,000 study, funded by the Elected Officials Transportation Committee, produced three design options for Rubey Park. The design presented on Tuesday is a combination of all three that address pedestrian safety, rider amenities and the issue of limited workspace for RFTA employees. Construction funding presented by Krueger is as follows: a Federal Lands Access Program grant ($2 million), Colorado FASTER grant ($1 million), Aspen ($500,000) and RFTA ($500,000). But Krueger pointed out that there will more than likely be additional expenses, shouldered by either Aspen or Elected Officials Transportation Committee, bringing the grand total to between $4 and $5 million. Councilman Dwayne Romero said he’s very curious about budget estimates, adding that he realizes the design is only 30 percent complete. Krueger explained that state and federal grants are only awarded if very exact budgetary details are provided, ensuring that number-crunching for the project will be scrupulous. Rubey Park, built more than 30 years ago, serves more than 4 million passengers annually, while handling as many as 400 bus turnovers daily in peak season. Krueger said the aging facility has numerous issues, including cracked cement, a lack of covered seating, inadequate restrooms and safety issues. “I would love to take you out there on a winter day to see” the conflicts between pedestrians, cars and buses, Krueger told Romero. Frisch said he’s in favor of a design that allows for as much parking for buses as possible. 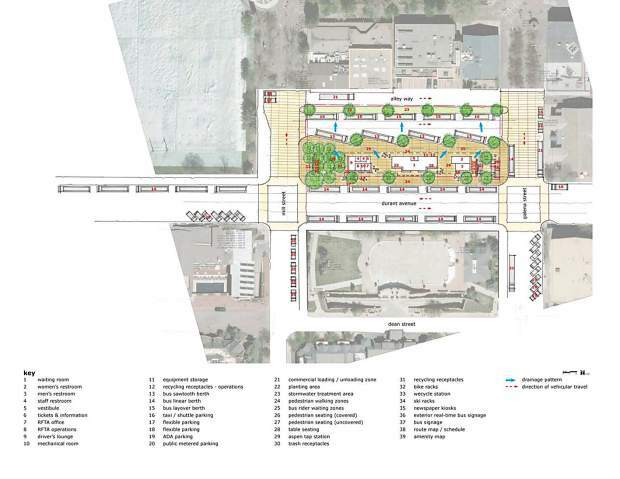 The stated goal of RFTA is to have 29 spaces, but the proposed design allows for 25. Frisch said anything less than 28, and Aspen will continue to see buses driving around town, waiting for parking, emitting pollutants. Frisch said he’d also like to see the existing structure torn down and replaced. “It’s not my favorite building in town,” he said. Mayor Steve Skadron agreed, saying he would be in favor of a new structure if its appropriate within budget. Councilwoman Ann Mullins asked how Rubey Park will be more park-like, as suggested in the design. Krueger said the idea is not necessarily to make it more park-like, but more mall-like, creating a smooth transition to the Cooper Avenue pedestrian mall.